These cups constitute the air-cells, alveoli, or vesicles of the lungs. They are surrounded by a close net-work of minute bloodvessels (capillaries), and it is here that the aeration of the blood takes place. The air vesicles have a diameter of from 1/100to 1/200 inch, and their number has been estimated to be 750,000,000 in man, whilst it must be at least three times as many in the horse. Their walls are composed chiefly of elastic fibres loosely interwoven, which confer upon the lung tissue the great elasticity it possesses, and the epithelium lining them is no longer columnar and ciliated, as in the bronchioles, but flat and thin, thereby permitting the free passage of gases through them. Fig. 200. 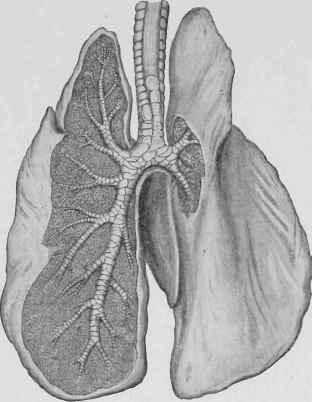 - The Lungs and Bronchi. The distribution of blood through the lungs is effected by the right heart and pulmonary artery, which contain dark venous blood. As the blood traverses the pulmonary capillaries around the air-cells it gives off carbon dioxide to, and takes up oxygen from, the air in the alveoli, and is then returned to the left heart as aerated blood by the pulmonary veins.